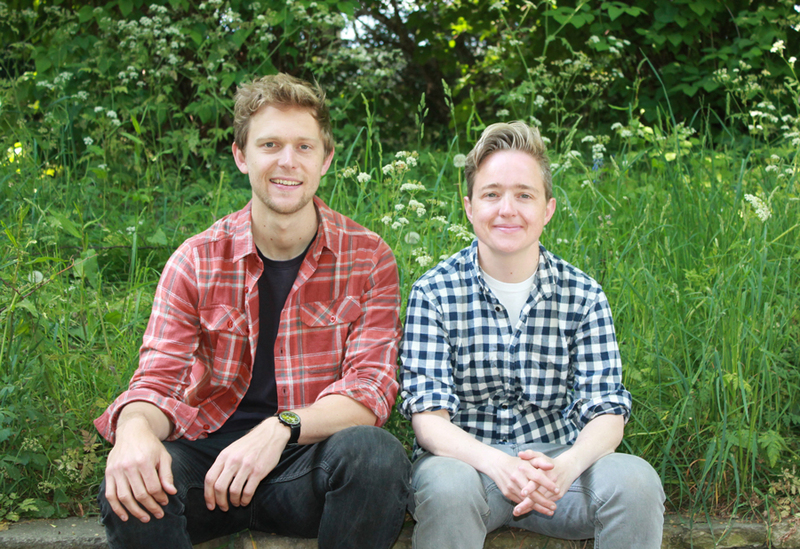 Two fast-rising names in landscape design have joined forces to form an exceptionally talented and exciting creative team. Charlotte Harris Studio and Hugo Bugg Landscapes have now merged to found Harris Bug Studio. Charlotte has just won a coveted Gold Medal for her first Chelsea show garden as lead designer for the Royal Bank of Canada (RBC) garden. In 2014 Hugo became one of the youngest ever RHS Chelsea Gold Medal winners and is a previous RHS Young Designer of the Year. Charlotte trained under Tom Stuart-Smith and although her Main Avenue garden was her Chelsea debut she has previously worked on a number of Main Avenue gardens, including the planting for Hugo Bugg’s award-winning RBC garden last year. The pair are already working together on a number of projects including an estate in the Scottish Highlands, six residential gardens and a retreat and wildlife garden for a new hospice site. They have also been collaborating on a design for the new 445 acre Royal Botanical Gardens currently under construction in Jordan. Hugo points out that the new studio wants to make spaces that people feel uplifted by and enjoy being in, whether that’s a private garden, a healing space, or an urban oasis in a busy city centre: “We have different and complementary strengths but are on the same business and creative wave length. By unifying our businesses, we will each be able to spend more time focusing on the parts we both love, and bring that as a benefit to our clients. We can bounce off one another and really drive for even higher levels of quality,” he says. 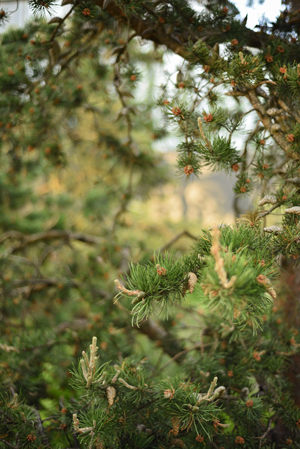 (pictured left, one of the Pinus (banksiana/Jack Pines, on Charlotte’s Chelsea 2017 garden). Tom Harfleet, head of RHS Shows Development and the RHS Chelsea Show Manager, is excited about the prospect of two of the most exciting designers to emerge in recent years deciding to join forces and combining their experience, creativity and passion for pushing the boundaries: “There is no doubt in my mind that this will be a powerhouse partnership,” he says. Hugo Bugg Studio will keep both existing studios in London and Exeter, with the two designers splitting their time equally between each. It will certainly prove a dynamic partnership. Hugo is interested in pushing the boundaries of garden design and has recently created a Tanzanian tropical rainforest glasshouse within the new MUSE science museum in Trento, Italy. Charlotte enjoys exploring patterns, processes and influences that distinguish a place. 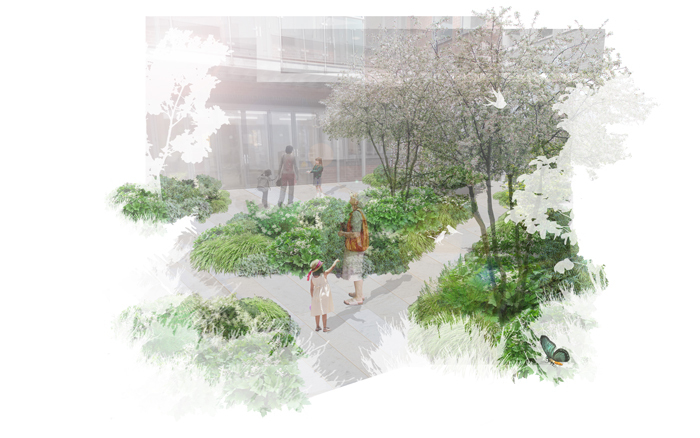 Her recent projects include the design, detailing and construction management of high value residential gardens, commercial projects, healing and wellbeing gardens and public spaces. We wish Hugo and Charlotte the best of luck in their new venture and hope to be seeing a lot of their collaborative talents in the future. Photo credits: Top picture and middle graphic ©Harris/Bugg studio, Pinus (Banksiana) ©Reckless Gardener credit E.J. Campbell Photography.